As I was looking through some old documents, I came across this article that was written by someone from Victory Churches International. I hope you enjoy it. For the past four years, Artur Pawlowski is one of a group of people who have been ministering at a street church in downtown Calgary, AB, just across from the Drop-In Center. This small group of men, a few of whom are Daniel Howard and Lawrence Irwin, have been following the word of God, preaching the gospel and feeding the hungry people of Calgary. At first, we had limited fruits in our ministry because we were soft and only whispering God’s word. We were going out one by one and not standing in unity. At that point, God had spoken to Artur through a scripture, Ezekiel 3:16~19, which says, At the end of seven days the word of the Lord came to me: son of man, I have made you a watchman for the house of Israel; so hear the word I speak and give them warning from me. When I say to a wicked man, you will surely die; and you do not warn him or speak out to dissuade him from his evil ways in order to save his life/ that wicked man will die for his sin, and I will hold you accountable for his blood. But if you do warn the wicked man and he does not turn from his wickedness or from his evil ways, he will die for his sin; but you have saved yourself. (NIV) With God saying this to our hearts, we could no longer whisper God’s words, but we must shout them out for all who will listen to have the chance to choose salvation. We have been sharing the truth of God’s word to all people. Yes, we have also been able to heal many people on the streets through Jesus Christ. For instance, a woman in a wheelchair was healed and began dancing before the lord our God. A baby with a heart condition was healed and did not need surgery; Many addictions have left the bodies of people through Jesus Christ, our precious saviour. A member of our worship team was in a car accident. She was told she tore all the ligaments and tendons in her foot and ankle and she would never be able to walk properly on It again, if she would even be able to walk on it at all. Through the power of prayer and Jesus Christ, within a month her doctor was amazed, as she would not need the many surgeries she was told she needed. In fact, her foot and ankle had started healing on its own, and within a month’s time she was up in an air cast and walking again! We need to warn people about their wicked ways and to turn and repent. Matthew 3: 1- 3 says: In those days John the Baptist came, preaching in the desert of Judea saying, "Repent, for the kingdom of heaven is near. This is he who was spoken of through the prophet Isaiah: ‘a voice of one calling in the desert, prepare the way for the Lord. Make straight the path for Him.’" (NIV) Finally, we have been preaching the gospel of Jesus Christ the way God wants us to: shouting it out and speaking the whole truth, bringing people forward for God. Preaching an uncompromising message the way God and prophets want us to preach with the Holy Spirit leading us. The point of God’s message has to be preached. Without repentance, there is no salvation. Yes, Jesus died for you and loves you, but He wants us to turn from our wicked ways so we can receive eternal life! Since we have been preaching the whole truth, thousands of people have been coming to Christ and hundreds have been baptized. Our main focus is to go and preach salvation to all the nations. 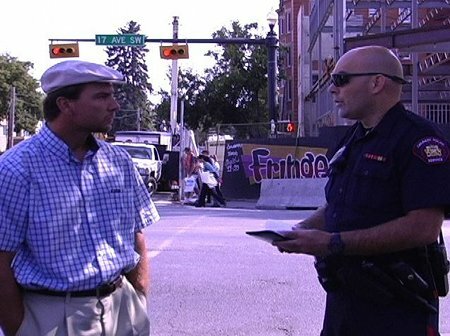 God’s grace gave us boldness to stand up for Jesus Christ in the city of Calgary. We are like a door to the city because we are in the most visible places; behind city hall and the federal government building, in the center of the entrances. We are also going to the city center. We have thousands of cars going by and sitting at streetlights, listening to our preaching. In the Bow River, there are boats and rafts passing by during baptisms. People are walking and riding bikes on the bike path, stopping, watching and listening every week. When Artur or someone is preaching, someone comes to the Lord. Hundreds of people are coming and going. We’ve seen many drug dealers, prostitutes, pimps and gangsters turning from their wicked ways and being healed, and are now helping in our ministry and giving testimony as to what they used to be and how God changed their lives! They are also helping others that are on the streets. Our- goal is to raise funds to buy a building to help the homeless off the streets. Our ministry has limited housing now for a very small number of people. Unfortunately, there is a larger need. We feed a few thousand people a month that are living on the streets. We serve chilli, soup, and Pizza. We also serve water and juices for drinks. But our focus is mainly on Jesus. We need to feed people spiritually with the gospel first, then their physical hunger. One Sunday afternoon, there came a woman in a Wheelchair. She told us she had been in her wheelchair for over 15 years. We knew this was true, as one of the volunteers at street church, who used to be homeless, herself, knew the woman years ago from the streets. The wheelchair bound woman was pushed up to our worship team as they were singing, She had asked for prayer, and a small group of people came, laid hands on her and began praying over her. For 15-20 minutes they prayed and a demon was cast out of the woman and she asked Jesus to come and cleanse her. She accepted Christ as her persona/lord and savoir!! As the worship team continued singing, the woman stood up from her wheelchair and started walking like a child taking their first steps. She walked up to the worship team, grabbed hold of a microphone and started singing the familiar hymn; l’ve got a mansion just over the hilltop." The anointing of God was 50 sweet and heavy across the field. The worship team began singing, "Banner over me, His love," As they sang, the woman began dancing! Dancing before the lord our God! What a blessing to be able to witness this take place. A woman who had never been seen out of her wheelchair suddenly accepts a life with Christ and begins dancing. Praise God!! This is why the Lord gave us the power to heal in His name; so people can see God’s love for them and look to God for everything. On August 12, 2006, a small group of people and I went to the park on the corner of 17 Ave. and 8 St. SW Where we used to minister on many occasions. At this time, there was a fringe festival under way in the park. We prayed and read the bible, as well as talked to a few vendors and patrons there. We left and returned again for more prayer and reading of the scriptures on August 14. The fringe festival had sorcerers, psychics and warlocks, only to name a few. We talked with some of the vendors about how the bible condemns such practices. The organizer of the fringe festival phoned the police, who told us not to talk to the vendors anymore. We were told to leave and told we could be further back in the corner of the park if we were to continue on. We prayed and left. Two days later, August 16, we returned again. Some were reading scripture and praying on the sidewalk, not talking to vendors like we were warned. We were simply reading the bible and praying, bothering no one. We had been prompted by the Holy Spirit to read Psalm 140. So we did. We were at the far corner of the park, about 200 yards away from the vendors. We started reading, gathering in a circle. We were spotted immediately by fringe festival security and advised that the police were on their way to arrest us. We moved further away to the sidewalk and continued reading the bible. We felt led to stay. Being threatened was a common occurrence. The police arrived. I had been videotaping the event as we do so often, due to threats against lives because of the preaching of the Gospel of Jesus Christ. I went over to talk to the police and gave the camera to Bogdan, one of the members. The officer asked me for my I.D. I told the officer it was away in my vehicle. He said I have no right to be in the park and I had to leave. J told him I wasn’t doing anything wrong, and the constitution and the charter of rights protected me. I was then informed by the police officer that in this country, Canada, he was the law. J told him, "No sir. In this country there is still a constitution and charter of rights." The officer asked for my I.D. again, so I gave him a business card with my name and address and phone numbers on it. He looked at it, then at me and gave me my card back and asked me for I.D. I told him it was in my car and I agreed to go get it for him, but I had one question first. He told me to go get it. I asked him why he was harassing me and he told me I was under arrest for obstruction. I then said, "I saw what people like you did to my country- freedom of speech and religion, violations of the constitution. My father could not enter a church building because he would lose his job. You’re arresting me for what." He answered, "For causing a disturbance, trespassing and obstruction." "Disturbance of what kind?" I asked. "Exactly what language you are using right now," he answered. I replied, "So I can’t talk now?" He said no. I told him, "Okay, have it your way. The officer took his handcuffs out and dropped them on the ground. He picked them up and grabbed my wrists, twisting my arms behind my back, and handcuffed me. He dragged me backwards to his vehicle and opened the driver side front door, then the driver side back door. I was attempting to get in the back where I thought he wanted me to go. He then moved me to the back of the car, turning me around and searching me. It was during this time I was speaking of my rights being in violation. The Whole time, Bogdan was recording the event. When the police were dragging me, my shoulder was injured. He handcuffed me so tight, two days after the arrest, my wrists were bruised. Five more police officers showed up in three different vehicles, including a police van. In the car, the police officer asked me for my name and date of birth. I saw on a paper tie had written 1979 for my birth year. I corrected this error and he ignored me, turned to his colleagues and said, "This guy is lying to me about his birth date." I said, "Sir, by calling me a liar, you are a liar." The other officers asked what to do with the rest of the team. The officer in the care replied, "They’re just Jesus freaks." He then left the car, and the information came back on the computer program in the police car. I noticed a ring of a skull on the officer’s hand. I started preaching to him everything I know about Jesus. When I was preaching, he became so nervous and walked off to speak to his colleagues. In the meantime, my brother David was being harassed, intimidated and provoked, having an officer’s finger shoved into his chest area numerous times, which hurt David. The officer took off his sunglasses and put his face right Into David’s, leaning towards him and said, "I am a Christian and I don’t agree with what you did." David calmly said, "That’s exactly what Jesus did, telling the ways of His kingdom". The officer replied, "You’ll never be half the Christian I am." David had his arms behind his back through the entire confrontation. Then David looked straight into the officer’s eyes and said, "You are lukewarm and God will spit you out of his mouth." The officer was so furious, he walked away in anger. The officer came to the car I was in, got in, and drove away. The rest of the group, I found out later, was asked to go home. They complied with the officer’s wishes and did just that. As we were heading downtown, I was speaking of the Gospel of Christ of sin and what Jesus did on the cross. I was saying that Jesus loves him and died for him. I said, "I can truly say I love you. I love you because my God commands me to love the one that persecutes me, hates me and does evil things against me. You arrested me for doing nothing wrong. You put handcuffs on me for no reason, but I still can tell you that I love you and I love you and I love you." The officer moved his mirror down and looked at me straight in the eyes. I looked back at him and said, "That’s right I do love you. Not because I am such a good man, but my God commands me to love you." He stopped the car in the middle of the road and got out. He went to a different car, looking very lost, and tried to say something. He came back to the police car and got in again. At that moment, God gave me a revelation of the officer being a young kid being hurt. I shared this with him. He turned abruptly to me and said, "That’s right, I was hurt, when I was a little boy. I praise the Lord for this gift." We got to the jail and he took me to the window where I then had to surrender all my possessions. I was searched again and was put on a bench with a man. I asked him what he was there for. I started preaching to this man and the officer came out and took me to a room, and then to the paramedics. He took the handcuffs off me and they were twisted. He asked me what J was doing with them because they were all twisted up. I told him jokingly, "I was biting them with my teeth." He was angry as he was trying to fix them with pliers. He took me to the booth where the phone was and he said I had the right to one phone call and I phoned my wife, then I phoned Lawrence Irwin. I said, "God, do I need a lawyer? If I ever need a lawyer in this case, you bring one to me." I was there for quite a long time, then, finally, some fellow came and unlocked the door, took me out and escorted me to my cell. The cell looked like from the movies: Iron bars that clanked when opened and closed. This was all very new to me; I only knew what I had seen in the movies. The door closed and the sound of it slamming shut shocked me. I think there were four or five people on the side of the cell, and one guy was lying on the ground and the garbage was all over in the cell, like a pigsty. Total depression, dirt and smell, so bad it was bothering you at first, and then you got used to it. I looked at the place and thought "When was the last time they painted." Juice boxes were everywhere. I looked at the guys in the cell and said, "Guys, they treat you like animals, and they want you to act like animals, but you are the creation of the Living God, Let’s clean this up." The lights were so bright. I started picking up garbage and they were looking at me. One by one, I took the papers and started piling them in the corner. Some of the men were sitting on the garbage. I asked if they could move their legs a little, they would and I would pick up the garbage from around them. I cleaned the whole cell. The pile of garbage was big and I didn’t want them to step on it, so I pushed it outside the cell, because the garbage can was not inside the cell. It was outside, far away. There were so many juice boxes, so I was trying to throw them Into the garbage. I was missing the garbage and a guard asked me what I was doing. I told him he wanted us to live like pigs because they had no garbage can in the cell. He kicked the boxes back into the cell and I Kept throwing them into the garbage can outside. Once everything was cleaned up, I said, "And now, I am going to preach to you all night." One man, to which I thought was Sleeping, quickly sat up and looked very shocked. He said, "Oh God! I thought I was in the park again!!" The guys were asking what I was doing in jail. I told them I had committed terrible deeds by preaching the gospel to people in a public place. I started preaching to them. A guard came and said my name and that he had some food for me. I did not see any water anywhere, so I grabbed the Juice box. There was a man looking at my food and he looked so hungry. I asked him if he was hungry and handed him my sandwich. Another man complained saying that no one had shared with him, so I gave him a sandwich and said I was keeping the juice for me, but he could have the rest of the food. I said, "Watch, my God takes care of me." A few hours later, they brought me more food and the guys were just looking at me. I said, "See, my God takes care of me." Then I kept the juice and gave the guys the food. I then saw water and knew I would have something to drink. I started preached and I preached for quite a time and got tired. I was very cold, very, very cold. They take your shoes away and your belt, and the lights were so bright all night long, they never shut them off. God reminded me of Paul and Silas in prison and they were always singing hymns, I thought, I’ve got to do this too, what hymn? "Amazing grace". I asked God to give me a voice to sing as I do not have a singing voice, and I started singing. I made it through the first line and the guys joined me after that. We sang amazing grace twice through. I got tired and sat down and this guy from the next cell said, "Hey preacher, are you still there?" I said, "Yes, God didn’t open the doors yet." He said, "Then preach it." I said ok, and I started all over again. Then, when I was finished, an Indian guy came to me with his fist closed. He came very close to my face and punched the wall next to my head. I said, "This is not a good day and I rebuke that demon in you." I started rebuking the demon inside him. He started cursing and swearing. The fellow on the other side of the cell asked the Indian why he was swearing at me since I didn’t do anything to him. I started preaching to the Indian and he sat down and started crying. I asked him if he wanted to be saved. He said yes, got saved and went to sleep. One of the guys I gave a sandwich to had an infection in his foot and up his leg. I asked if I could pray for him and I did. The pain was so bad for him. We prayed for his foot and he went to sleep too. After a few hours he woke up in huge pain and he was begging the guards over and Over to take him to a doctor and the guards refused. He was really begging a lot. After a few hours of begging and crying, he was swearing. Finally, a guard came and showed a little mercy. The guy tried to stand up to walk and he fell to the floor. The guard just stood there. Somehow, he managed to get up and walk out. He came back a little later, very depressed. I asked what happened. He said they took him to the paramedic and was told he was going to lose his toes if he didn’t go get some help. The guards wouldn’t take him to the hospital. I told him, "Not everyone is like those guards. There are many people that care for you." He took his shirt off and showed me all his tattoos. He said, "Look at me. I am covered in tattoos. None care for me. I am a criminal. They care for you, not me." I told him that was not true. I care for him and there were other people that care for him too. I told him his story would be told. People were looking at me and asking me over and over, who are you? Who are you? I said, "I am a son of the Living God!" They all were asking me what I did to end up in jail. They couldn’t believe I was locked in jail for reading the bible. One guy said he couldn’t understand. He said they were criminals. They do bad things and deserve to be there, but I didn’t deserve to be there. Hours passed and the guards brought new people in. I asked one of the guys what he did. He said he slashed someone because of vengeance. I said, "Why are you so stupid? That’s stupid. Are you feeling better now?" He said no, I said, "That is the stupidity we have without God. Are you happier now? He said no. I preached the gospel to him, the peace of God and forgiveness. A little while later he was out on bail and released. Then the guards came for me, and I was taken to the room where they do the fingerprints and pictures. I smiled in the picture because I wanted them to look good. Then they fingerprinted me. The machine just swings back and forth and takes your fingerprints. I told the guy taking my prints that it was cool and he agreed with me. Then they took me back to a different cell and I started preaching all over again. This cell was also full of garbage and very dirty and the lights were also quite bright. I said the same thing as before and started cleaning. It was strange. It was as if God was having me clean the cell before I preached to prepare the way for Him. I think. God was preparing the ground and the hearts of men for the gospel. This was about 12 or 1 in the morning. The guards brought in this fellow, about 45, with a Russian accent. I said to him, "What did you do?" He said, "I was fighting with my son. I wanted to beat up my son, but he beat me up and I called the police and I got arrested." time was passing and more people were added to the cell. The Russian guy looked at me and said, "God is going to take care of us, right?" I told him yes. There were a few others that were really touched as well. I didn’t force anyone to say the sinner’s prayer. If I saw they were touched, I asked them if they wanted to say the sinner’s prayer and some of them did. I did what i felt at that time, and the rest is in the hands of God. I was then transferred to a third cell, and it was morning already. There were a few people in the celli four or five of us. A young guy, 22 years old, started saying he was going to kill himself. This was around 9 a.m. I was really tired. I told him, "Fine, you want to kill yourself, fine. I will help you. There is a toilet there filled with water. I will hold your head in it. I am sick and tired of listening to you wanting to kill yourself, so I will help you.1I He was staring at me. I asked him, "Are you ready? Let’s go." He started crying. He said he was 22 and his life was over. I told him he was young, his life was just starting. He said, I grew up in church and you don’t understand. My mother rejected me. I phoned her from jail to get help with a lawyer and she hung up on me. I called my lawyer and he wants nothing to do with me. I have been a crack-cocaine addict for years and I am a thief. I steal to get what 1 want. Now I have my own apartment and the cops caught me, I am going away for years." I told him, "Use those years to come closer to God. Take some bible courses and with God, anything is possible." I preached only to him for over an hour. I told him Jesus will always be there. He will never leave him or forsake him. Jesus will always be by his side, the guards came and put chains on the guys and put them in a line and they put me in another room, the man yelled out, "Artur". I said. "What", He said he heard me talking to him and he was listening. The guards took the guys away. I said to God, "God, If It was for this one man that this whole thing happened to me, it was worth it. But you touched many more," Then a crown prosecutor came and asked what I wanted to do, and gave me two choices. I could go to the Remand center and if I do that, I would have to spend another day there before I could go to court and see the judge, or J could Sign a paper saying I won’t go back to the fringe festival. I asked God what he wanted, and I felt my work was done. I told the prosecutor I was ready to go to the Remand center. He asked me if I really wanted to go there. I turned to God for wisdom on what to do; the prosecutor said he would come back in a few minutes. I felt very tired and drained. I felt, that’s it. I did what I needed to do. He came back and I told him I would sign the paper, and he took me before the judge. He stated all my charges and the prosecutor said he would let me go if I stayed away from the park. The judge asked me if I agreed. I said yes, and they brought me papers to sign. I told tile judge that I wanted him to know that I was arrested for reading the Bible. The judge said, "Yeah, I know, but this is not a trial. You will have a chance to tell your side. If I said I knew that, but I wanted to let him know why I was arrested. I was brought back to get my belongings. I was released and left: around 11:30 or noon. I went down to the street and thought about the movies where people spend like 20 or 30 years in jail and come out, look up to the sky, and say how good it is to be free. So, jokingly, I put my head up and said, "It’s good to be free!" The sky was blue. I walked away and took a train to my vehicle, where I had parked in a two hour zone. I got there and had no tickets and no towing of my vehicle or anything! I took my van, went home. The next day I was preaching back on the streets. We are preaching in seven locations like never before, shouting the name of Jesus like never before When you stand up to Satan, he cannot win. He has to flee. Acts 5:39 says: But if it is from God, you will not be able to stop these men; you will only find yourselves fighting against God. (NIV) Since the arrest, we have been threatened on many occasions by the by-law people, the parks department and police officers with tickets and other things. I think: God, if this is Your Will, Your way for me, then send me. Being a father of two and being faithful to my Wife, coming from a communist regime, seeing soldiers and tanks on the streets, witnessing minority ruling over majority with destruction, loving Canada with all my heart, having my own family and house in this country, being in the perfect will of my Father In heaven, I have an obligation to stand for what is right, to preach the gospel like Jesus commanded and tell people about the ways of the Lord so they can have the peace and righteousness from the Lord. Proverbs 1; 11 says: A false balance is an abomination to the Lord, but a just weight is His delight. (NIV) I went to jail not for me, but for Jesus. If needs be, I will go there again until a country that God brought into my life will raise up into that place that God calls it to be. A nation in His word will bring healing to many nations. Rise up, oh Canada, so God can keep you glorious and free. Our Ruler Supreme, hear our humble prayer. Have your dominion from sea to sea. Oh Lord, keep our country glorious and free.